A Bulldog is a type of dog breed that originated in the British Isles. It’s descendants are the ancient Asiatic mastiffs. The name ‘Bulldog’ came from their jobs as bull baiters, not to mention their robust and powerful builds like bulls. In the olden times, they were prized for their ferocious character and courageous demeanor. They are also powerful enough to attack full grown bulls in the bull baiting arenas. In the 19th century, bull baiting was banned, and they transitioned from the vicious and barbaric role of fighting animals, into prized pets. Nowadays, bulldogs are not as ferocious and aggressive as their ancestors were. The vicious temperament has been somewhat watered-down, and the breed has become more of a house pet, but bulldogs still maintain their strong determination and bravery. Bulldogs are known for their wrinkles, and they have become one of the most popular breeds of today. They are equable, resolute and dignified. There are many types of Bulldogs, and the most common categories of the breed are the American Bulldogs and the English Bulldogs. There is also a type called French Bulldogs, which is believed to have been derived from the English bulldogs. When you talk about Bulldogs, the most commonly referred to are the English Bulldogs. 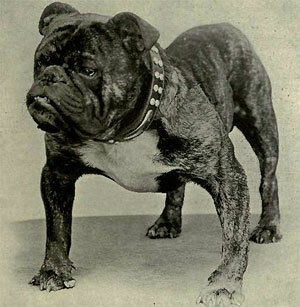 They are considered as the classic type of Bulldog. This Bulldog is, obviously, bred in England. This type has a large head, which is broad, with a distinct wrinkly and droopy face. English Bulldogs have short legs, and sport amusing wide stances. They are only about 15 inches in height, and may weigh around 50 pounds. Shorter English Bulldogs are more valued in show competitions. Although they are not your typical lap dogs, they would like to be one. However, do not be mistaken, since they are brave and tough enough, they will not back down in any challenge. Among the different types of Bulldogs, American Bulldogs are considered to be one of the largest. Due to their larger size and longer limbs, they are significantly more athletic. They move considerably faster, in a more agile manner, and they move more explosively. They are about 25 inches tall from the withers, and can weigh up to 125 pounds. Since they are much taller and more agile, they are more prone to hyperactivity, but not as much as other breeds. Characteristics of these two types of bulldogs are fairly the same. Both types require firm and consistent handling. Owners must be strong-minded and should never be timid. These dogs are relatively inactive indoors; however, English types are more suitable for apartment life than their American counterparts. This is mainly due to the English Bulldog’s smaller size, and tendency to be lazy. The English Bulldog is considered to be more of a indoor dog. American Bulldogs, due to their athletic nature, are relatively more active, and they thrive outdoors. They are often used by small farmers and ranchers as an all-around working dog for many tasks, such as a guard or for hunting bear, wild boar, raccoon and squirrel. American Bulldogs can be of two types ‘“ the Johnson and the Scott. These names are from the breeders who were influential in breeding them. 1. English Bulldogs are shorter, and have more distinctive wrinkly and droopy faces. On the other hand, American Bulldogs are taller, and their faces are not as wrinkly. 2. American Bulldogs have longer legs, and are significantly more athletic than the compact English Bulldogs, with the shorter legs and amusingly wide stances. 3. English Bulldogs can be considered lapdogs, while American Bulldogs are more like working dogs. 4. English Bulldogs are more of an indoor type of dog, while American Bulldogs thrive outdoors. Ian. "Difference Between American and English Bulldogs." DifferenceBetween.net. May 19, 2011 < http://www.differencebetween.net/science/nature/difference-between-american-and-english-bulldogs/ >.